I love decorating with globes. They are like a round, blank canvas! 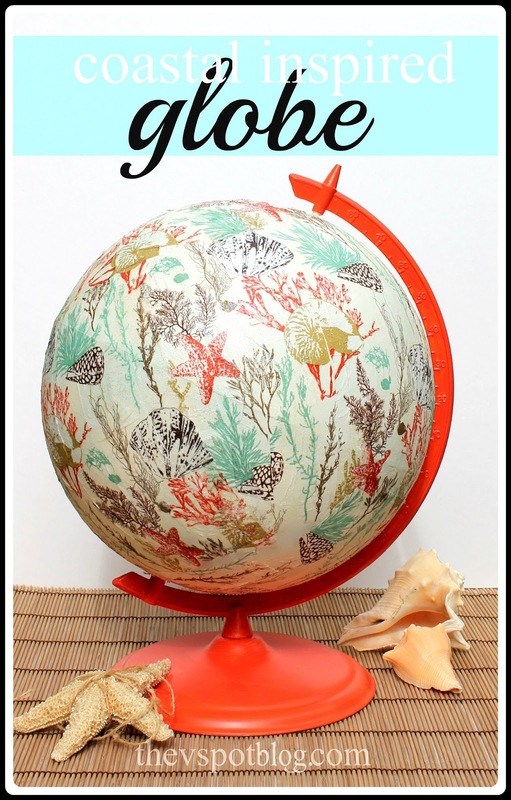 A few summers ago I took an old globe that I have made over several times and gave it a beachy-blue ombre paint job. 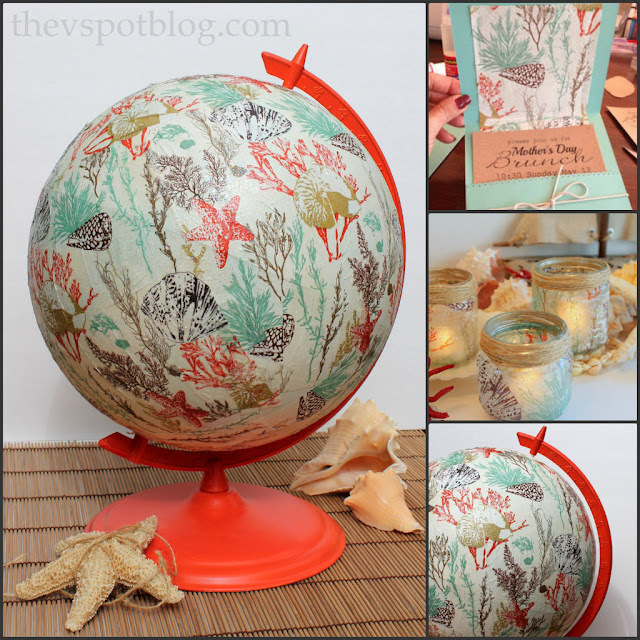 Today I wanted to show you that same globe with a coastal inspired make-over. The materials needed for this project? Paper napkins, Mod Podge and a little paint. A few months ago I picked up what I thought were rather expensive paper napkins at Roger’s Gardens. (I tend to buy my napkins at the Dollar Store, so $5 for a pack of 20 seemed kind of pricey to me.) However, I’ve now used them to make brunch invitations, candle holders, and now this globe make-over, so I am thinking they were a pretty good deal! Start by spraying your globe with a white primer. You want to make sure it’s a solid color or the globe’s markings will show through underneath the napkins. In this particular instance I gave it a light coating of Rust-Oleum’s Heirloom White as well, so that it was closer to the cream color of the napkins. The napkins I used were 3-ply and had a colored trim around them, so I started by cutting that off, then I pulled off the printed ply of the napkin. Cut it into strips about an inch wide and line them up in order so you can keep track of the pattern. You can use scissors, but I though it was more efficacious to use my paper cutter. If you don’t have one, don’t worry, scissors are just fine. Brush a light coat of Mod Podge onto the globe where you want the strip of napkin to go and gently press it onto the globe. I used Sparkle Mod Podge, but you can use any kind that you’d like. Line up the patterns as you add the strips of napkins. This was a bit of a challenge for me. I started by using a longitude line on the globe as my guideline. For the ombre globe, the latitude lines were helpful for creating the gradations of color. For this project, it gave me an angular coverage and I found myself having to do a weird patchwork to finish up the coverage. So yes, there is a “good side” on this globe, but the pattern is a forgiving one, so the spots where things don’t quite line up isn’t that big of a deal. Just keepin’ it real. Once the Mod Podge had dried, I mixed a little bit of Martha Stewart’s Habanero with a larger amount of Carrot until I got a color that I liked. Paint it on, let it dry, then enjoy your new coastal inspired globe for the summer. I’m pretty happy with how it turned out! I am loving these napkin crafts. Do you have an item that gets frequent make-overs? What is it? I really love this project! What a great idea. 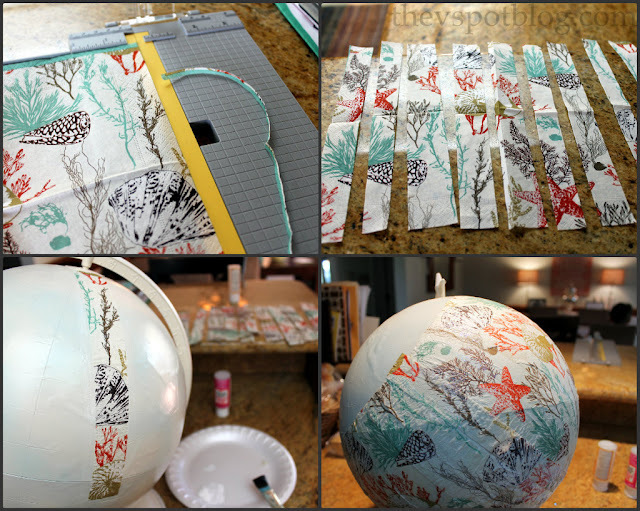 I have a globe on my desk that just doesn't match my decor… I see a mod podge project in my near future. Thank you!! I love this! I think I might save napkins from all the places we eat on our Europe vacation and make one to remember our trip! What a cool globe! Great job! I love it! Absolutely gorgeous! Where do you find the globes you use? I've been looking a while now and not had any luck. What an awesome idea VIV!!! I love this and looks so hip! I have a globe I bought a few years ago at a yard sale and I've yet to do anything with it… lol. I just saw this beachy globe on Pinterest and I had to stop by and tell you what an awesome job you did. It looks amazing, I would love to incorporate something like this into my beach decor this year. Might have to add this to my craft to do list!